Elaine Shooter Alexander is shortly set to embark on the challenge to become the first woman from Northern Ireland to circumnavigate Ireland by kayak. The challenge will involve a solo voyage of 1000 miles battling tides, headlands, cliffs, not to mention unpredictable weather. The motivation for the trip is not only the 1000 mile challenge but also to raise much needed funds for the registered charity – SHARE. In 2011 SHARE based in County Fermanagh will celebrate 30 years of providing outdoor activity programmes which promote the inclusion of disabled & non-disabled people in a wide range of arts, land and water based recreational programmes. Elaine’s trip will begin at on Tuesday 3rd May from County Antrim Yacht Club in Whitehead on the shores of Belfast Lough. Almost immediately her first challenge is to cross Belfast Lough’s busy shipping channel which includes the fast moving Stena HSS. From there she will continue her clockwise route before returning to the same location in approximately two months time. Before departing Elaine will officially open the newly refurbished boathouse at County Antrim Yacht Club, which was originally built in c.1870 to house the local lifeboat and was an integral part of the Coastguard station. The boathouse which is a listed building and a fine remnant of maritime history within the Whitehead Conservation Area has been extensively refurbished and will provide a storage facility for canoes and kayaks. 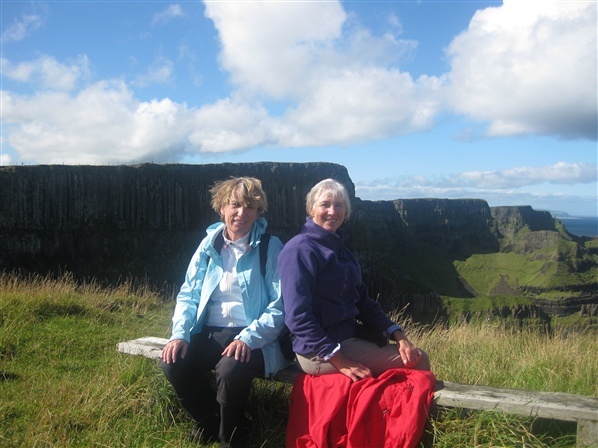 It will not only be used by local members but will act as a top class facility for visiting canoeists and kayakers using the soon to be launched East Coast Canoe Trail, a key highlight of this trail is the nearby Gobbins cliffs residence to a puffin colony. The present Commodore of Commodore of County Antrim Yacht Club said "we are delighted Elaine has chosen CAYC for her starting point on what is a special day for us with the official opening of the refurbished boat house, Elaine stopped off with us on her last trip around Ulster and we are sure that she will be amazed at the transformation that has taken place since then. We look forward to welcoming Elaine back on the completion of her challenge and hopefully many other canoeist’s and kayakers in the future." 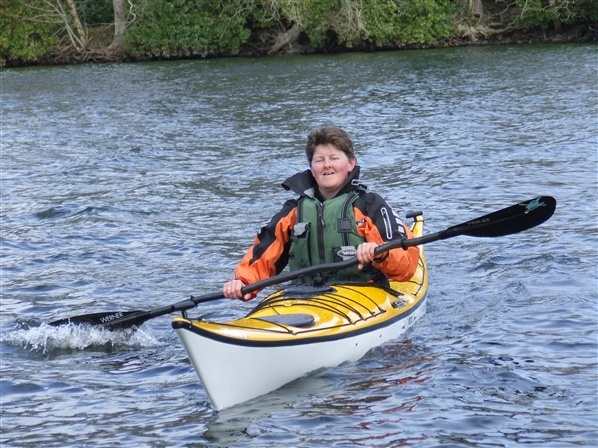 A well-known personality in Irish canoeing circles with recognised pedigree, Elaine has successfully combined a career as an outdoor pursuits instructor at SHARE along with competing in local, national and international canoeing events. This measure of competence is coupled with a competitive streak which reached its pinnacle in 2005 and 2007 when representing Northern Ireland at the Surf Kayak World Championships in Costa Rica and Mundaka respectively. It was whilst taking disabled groups canoeing at SHARE that Elaine got her inspiration for this challenge and the target of fundraising £10,000. This money will be allocated towards a fully accessible bus which will ensure further disabled groups will be able to travel and enjoy an outdoor recreation experience on Lough Erne in the future. Fundraising is of paramount importance to ensure this charity can continue to deliver its much needed work. Elaine’s trip has been made possible with generous support from Valley Sea Kayaks, Desperate Measures, Lendal Paddles North South Marine, River Lake Sea, Yak, Brookbanks Canoes and Kayaks, Signal Signs, Asda Enniskillen, Canoe Association for Northern Ireland and Blackthorn Design. Eye Feel Good Charity Canoe Trip Ready for the off!! The annual Eye Feel Good charity canoe trip is certainly making great use of some of Northern Ireland’s unique canoe trails. 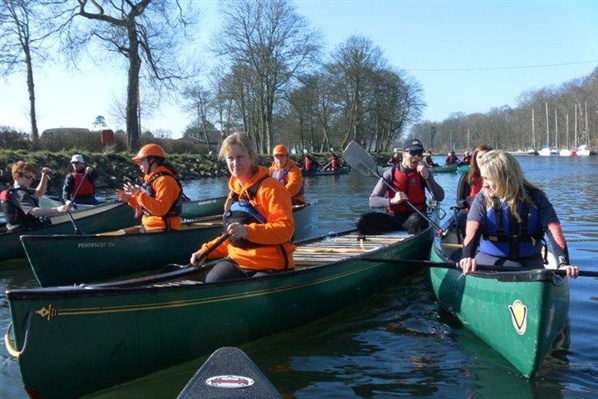 Their paddle from from Antrim to Castlerock will take in both the Lough Neagh and Lower Bann Canoe Trails on 14th to 16th April 2011. The 2011 expedition which will involve 36 paddlers and their team mascot 'Sally' is made up of some old faces from last year, some experienced paddlers and some folks who are new to the world of paddling. One of Northern Ireland’s leading canoeing providers is supporting the expedition. John Huubucks from Mobile Team Adventure said "What can I say about these guys. Each year they just seem to keep pushing the envelope further. Eye Feel Good's inclusive thinking towards paddle sports and fundraising is refreshing and inspiring. I'm delighted to be working with the guys on this year's expedition. We have a great group of participants and it's going to be an amazing trip"
Eye Feel Good is a charity foundation based in Northern Ireland with the aim of raising money through organised events donating to those living with cancer within the community. You can support the participants of the 2011 expedition by donating on JustGiving. To get a feel of what it is all about check out their blog on the training event on the Lough Neagh Canoe Trail. Good luck guys from all at CanoeNI.com – a great challenge for a worthy cause. Jim, my Irish brother-in-law had been waiting for us at the train station in Derry just to say Hello to us. He was right to shrug his shoulders when we told him we wanted to go to Castlerock. It wasn't the most beautiful place on earth in spite of the pretty name, we were aware of that the minute we got off that train, after what was said to be the most scenic train drive in Ireland. The restaurant at the train station was not the most inviting one, either. The landladies had recommended it saying it didn't look very good but that the food would be ok. However we didn't want to have food that was ok, we wanted to have good food, and we were all very disappointed about the outside and the interior design. Nevertheless I booked a table for fourteen women and asked for the way to Mussenden Temple, while the other thirteen couldn't wait to start exploring the area. And a good thing too, that they didn`t wait. Because they found a golf club with a restaurant, directly by the sea, in the dunes, but with a beautiful view. That was exactly what we wanted. The only problem was, they didn't want to let us in, because we had to be members of a golf club or at least family members of a member. So I went in and Paul, another brother-in-law became my husband for a very short while. I told them he played golf in the South though I didn't know the name of the club. This was ok, what they didn't like were my clothes and they showed me a big sign with the dress code, at the same time looking me up and down. “We are walkers, fourteen women,” I said proudly. “They all look the same, they all look like me.” I didn't want to give in, it was either or. “Come at seven,” they replied. “We will prepare a table for you.” We had made it, great. The next step took us a little longer. We walked up a path alongside a new caravan park which was very tidy but also very awful and surprisingly empty. ”They are all the same”, I said, kind of apologising, I don't know why. Then there was a fence along the side of the sea and I wanted to apologise again. But after a while we had left both eye sores behind and we saw my Ireland, green meadows, cliffs, the sea, heather, stone walls, name it. 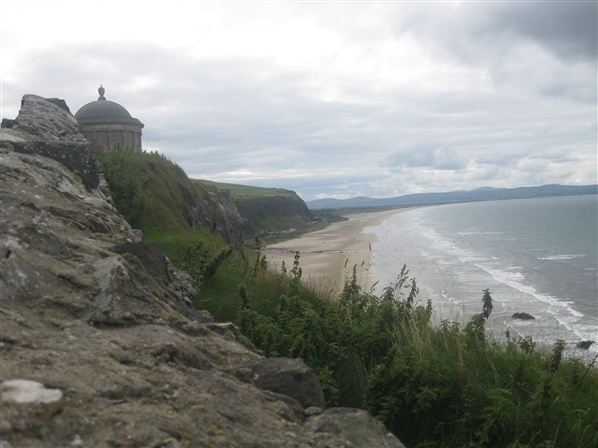 And after another little while we actually saw Mussenden Temple, our destination for that day, right in front of us. But the worst was yet to come, because Mussenden Temple was standing on another cliff, and in order to get there we had to climb down and up which at that moment we didn't have a clue how to manage. While some of us were discussing what we could do and that we didn't actually have to touch the temple, some of us had already climbed down, found a bridge over a little stream, even discovered a nice little lake and we saw the red and blue and green anoraks on the other side of the cliff before we had even come to any decision. That spurred us on, of course. We tried as well to climb down and we got there, too, although it was quite difficult at least for me to climb all the steps on the other side. We were rewarded though, looking down at the rails of our scenic train, which disappeared in two tunnels underneath the cliffs we were climbing, the picture postcard image we had seen so often. And then we approached Mussenden Temple, which really was as magnificent as Beate, my sister had been telling me in all these years. It was much bigger than we had expected looking at all the photographs, not like Pulnabroune which is much smaller in reality than in the pictures. The cliff and the window to the North was one vertical line, it was even more dramatic, looking down out of it after we had gone in. We wondered why this hadn't been washed into the sea like the nearby Dunluce Castle, though we were happy to still have the full impact. We would have liked it had it been built just for us, not after our death, but while we were still alive. Now we had it, almost all to ourselves. Then we walked southwards to the road, just to come back walking towards the temple and the sea at the same time. It was sheer bliss, pure happiness, one of these moments in life you never forget. It was the start of our wonderful walking tour on the Giant's Causeway Route and it was more than worth the little detour via Castlerock on the train. 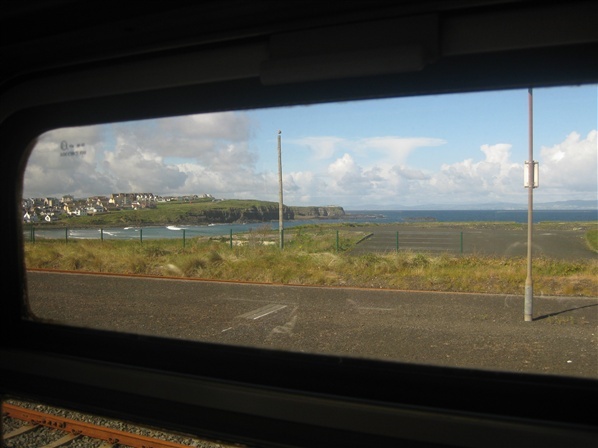 We are sitting on the train from Castlerock to Portrush, we have heard that this is one of the most beautiful train drives all along the North coast of Ireland. 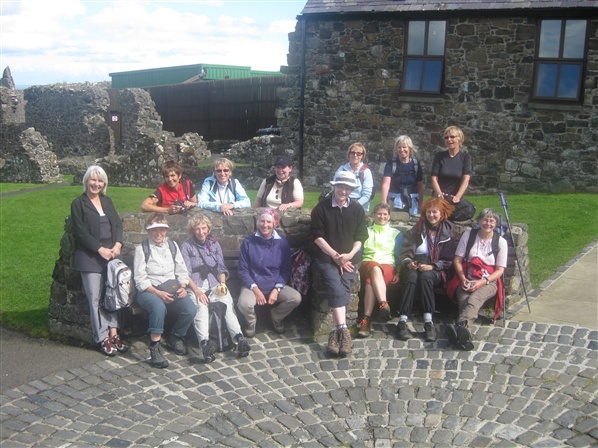 We are 14 women from Germany and we mainly want to walk this North coast, but now we have to get to our starting point which we chose to be Portrush because from Portstewart it would have taken too long to get to the Giant's Causeway in one day. We are all very happy and relaxed, enjoying the wonderful scenery and talking a lot about the beautiful breakfasts we have had in two different B&Bs. Petra and I got a little flower again, we seem to get that every day now, we put it into our hair and photos and more photos are being taken. Petra and myself are not the official guides but we have planned the trip and in situations like this I can fully relax. We have to change in Coleraine, it is a wonderful old station, and over a very nice bridge we are getting to the other platform. There are quite a lot of people waiting for the next train at this relatively small train station, the reason being that there are two trains leaving from that one platform and an official is trying to get the people to the right train shouting and running back and forth at the same time. We almost missed that because we were talking so much among ourselves, not paying attention, but when I understand what is going on we move through the crowds in single file and I am happy we made it. At last we are on the right train; at least I am convinced about that until one of the women asks me why there was one sign saying "from" Portrush and another one "to" Portrush, that was very confusing. I get a shock. Which direction are we going, where is the sun? I feel my usual panic. But there is help, immediately, the conductor is coming to ask for the tickets and we ask him directly are we on the right train and he tells us of course we are. Unbelievable, that can't be possible! Have we understood it properly, is he really going with us? After getting off the train we tell everybody again to just follow that man quickly. It is not easy rushing 14 women through a town and a pretty one as we can see now just trotting behind him, with no time to have a look at anything, that is really hard. Not everybody has fully understood what we are doing but we all follow, no complaints. But I am totally stressed again because I think we are walking into the wrong direction. Wasn't the sea on the other side? Hadn't I seen it from the window on the train? Why are we walking into the town? Thank God we are in Ireland and nobody is taken hostage here, but it is really strange. He should know where the beach is, why are there more and more houses, and why is the sun on the wrong side? I am totally frustrated. But then there is a gap in between all the houses, there are steps down to the most beautiful beach and the nice conductor stops and indicates with both his arms that this is our way. It is like being on the Bahamas only here it is much nicer. We all want to thank him but he is already rushing back otherwise he would miss his train. 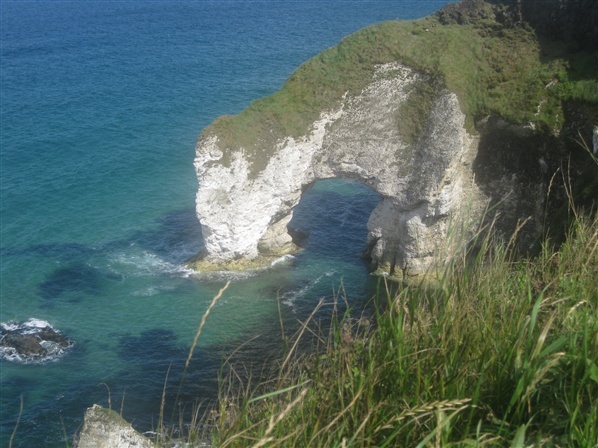 With all the excitement I had completely forgotten that Portrush lies on a headland and that there are two beaches. So now we are all standing there amazed and astonished looking into the glaring sun and we happily start our walk into the East, Giant's Causeway here we come. We have been walking through the rain for almost one and a half hours now, the worst rain we have had so far. The plan was to take the bus from the car park at the Giant’s Causeway to Ballintoy and then walk back along the coast for as long as we could. But the women wanted to walk this way, the Cliff Top Path in spite of the rain. And it feels great although it is raining or simply because it is raining. Because when the rain suddenly stops, when the sun comes out we do not only have the view over the sea, Rathlin Island and Scotland but also over half of Ireland, well a third, maybe, but that is more than enough, and more than we had imagined. 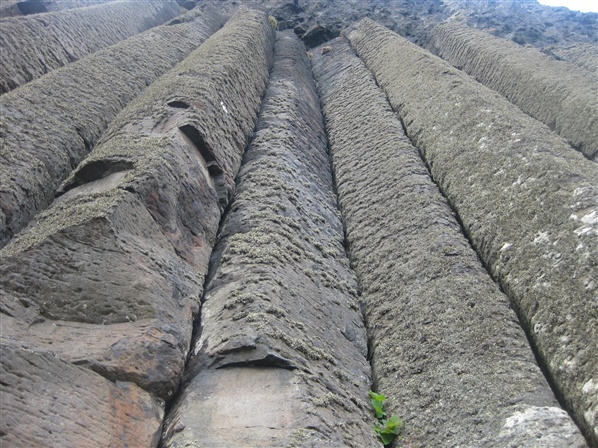 If you walk the path at the bottom of the cliff you can see the columns directly in front of you, you can touch them, you can stand in front of them and measure them, you can put your hand into the little bit of water in the concaves or you can stroke over the convexes, you can run, walk or climb over the columns and it is like being at a giant playground. You can also try to understand how these wonders got their shape by reading all the information displayed there on big charts. If, on the other hand, you walk the top path, you have the full drama below you, behind every curve, behind every bay you can see new, different giant columns, newly placed, newly put together in different colours, in different light. We often stop, stand still, look back, we are wet to the bone but we don’t mind, taking in the sight of this constantly changing performance of nature. There are more and more columns, more and more beautiful and more dramatic. Or is that only our imagination because we hadn’t expected that. In mid August the peak holiday season we only meet one young couple who come walking towards us, apart from that nobody is walking the whole Cliff Top Path today. Then some hours later we descend and the green blue brown dream becomes the golden dream of Whitepark Bay, another highlight we really deserve after climbing over and through the white rocks at Portbradden. We are able to do this because the water is still out far enough. We have the feeling we are walking through Heaven’s door although we have just come from paradise. We sit down at the beach, some take off their shoes and socks and try the water, we are more than exhausted but very happy. A little bag with nuts and raisins is handed around from one woman to the other and there are a few biscuits left as well. Nobody mentions the word coffee, but everybody knows that we are all thinking of that. At this time we don’t know yet how very pretty the little harbour of Portbradden is and that there is a tiny little coffee shop just waiting for us. But that will be the next story. The End of the Giant’s Causeway. We have booked a beautiful B&B for all fourteen women between Ballintoy and Ballycastle, like a dream, everything, the location, the big garden which is a like a nature reserve, the house itself, the view over the sea to Rathlin Island and to Scotland, even the full moon at night, a little hazy but that is just right and intensifies the mystic atmosphere we all had hoped for in Ireland. 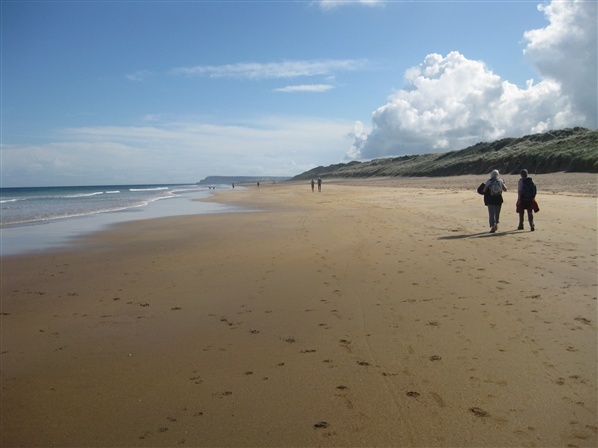 We are lucky that it is not directly on the road, and also very happy that it is a bit outside the town of Ballycastle. Twenty minutes on foot we were told and that was ok. for us even after a long day’s walk. At the moment we are the only two women who have to walk to town for the evening meal, the others are taking the bus from Carrig-a-rede to Ballycastle, we were too exhausted, so we didn’t walk to the bridge after the lovely coffee break and delicious cake in the romantic, sun drenched harbour of Portballintoy. A nice family gave us a lift in their car to our B&B, like paradise, how lucky can one be. And instead of being sea-sick on the bridge high above the water we are having a shower, feeling the warm water running over us, and that is also very good. We feel relaxed and refreshed and we think that it is no problem to walk the twenty minutes into town. Unfortunately that was terribly wrong. First we realise that there is no kind of path or anything similar along the road. There are sharp bends, rises and dips, so that the car drivers can’t even see us nor can we see the cars early enough to step into the ditch or cling to the hedge. We had assumed that there would only be a few cars on this road and that they would drive slowly enough because of the condition, but even that is a mistake, the cars are speeding even overtaking in spite of the bends. We haven’t experienced anything like this before, we are really afraid and don’t know what to do. We would have gladly gone back to the bridge just to sit safely on the bus now like the other women. It takes us one and a half hours to get to the edge of the town. Fortunately the last bit is past a little wood on a path, and when we get to a caravan park, we are totally exhausted. We are lucky again because a couple driving out of the caravan park offer us lift and after another ten minutes we reach the restaurant in town still in one piece. Big hellos there, we haven’t seen the others for such a long time. “Carrick-a-rede was stunning, breath taking, really, you should have come, it was great to walk over the bridge, no problem at all, it was super. We hardly dare to tell them our story, we are still under a little bit of a shock. We tell them instead about the great location of the B&B, the friendly people who gave us a lift, but after a while we can’t hold back this very negative feeling, we tell them about the distance, the dangerous road, and worst of all the speeding cars. I can’t remember anything like that in Ireland. In the seventeen years I have lived in Ireland I have only seen and met drivers who take care, who give way, who take their time, who do not speed like mad, this is a completely new experience for me. But now we would like to eat and it is wonderful. We get real Irish food, simple food, excellent food. We all decide to take the cod, and it is a big piece of good tasty fish and champ, the fish just done in butter, the champ homemade with cream and scallions, no frills just natural and delicious, not even too much salt and pepper. Great, the often mentioned paradise is back again, and on top of that we have good wine, a cosy pub atmosphere and later live music - we are in Ireland. Much later we all decide to all splash out on taxis but we explicitly ask the taxi drivers not to run over any walkers, neither German nor Irish ones. I am German, I was married to an Irishman for many years so I also lived and worked in Ireland for quite a while. I am still in love with Ireland and come here regularly, now bringing people over who also love it.